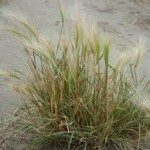 Foxtails can become a health hazard for dogs and other domestic animals, and a nuisance for people. 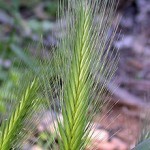 In dogs and other domestic animals the foxtails can become irreversibly lodged. 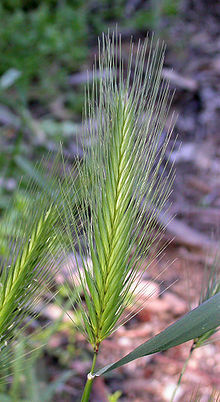 Foxtails can also enter the nostrils and ear canals of many mammals. In all these cases, the foxtail can physically enter the body and muscular movements or, in the case of nostrils, air flow, can cause the foxtails to continue to burrow through soft tissues and organs, causing infection and physical disruption, which in some cases can result in death. In humans, foxtails can go through clothing, particularly fabric shoes and socks, causing discomfort to people while walking. Foxtails are a problem beginning when the grass inflorescences begin to disarticulate, and ending when the spikelets or spikelet clusters are mechanically abraded or incorporated into the soil, turf, or leaf litter. In some habitats, this can be a matter of weeks, but in others it may require months, especially if different species flower and fruit at different times during the season. Foxtails that have progressed no further than surface lesions may be removed and the lesion treated with antiseptic and bandaged if necessary. Once a foxtail has passed beneath the skin, dogs are often treated with systemic antibiotics, and the foxtail either allowed to encyst and degrade, or in the case of actual or imminent organ damage, removed surgically. However, surgical removal can be problematic, since foxtails cannot easily be imaged by x-ray or ultrasound. Foxtails imbedded in the nostrils can migrate into the nasal turbinates, causing intense distress, and in rare cases into the brain. Foxtails in the ear canal can puncture the eardrum and enter the middle ear, causing hearing loss. Combing of fur removes foxtails along with burrs and other detritus, but potentially the most dangerous foxtails are found in areas easily missed: the axillae, between the toes, and in nostrils and ear canals. Occasionally they can even lodge in the conjunctiva under the eyelid. Many wild barley species are weeds in disturbed habitats, and their growth is encouraged by foot traffic of humans and domestic animals. Control methods consist of restricting traffic to established paths, and eradication of wild barley by mechanical removal or herbicide. 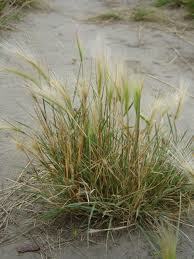 Some other foxtail-producing grasses, especially needlegrasses, are dominant species in stable grassland habitats. Control attempts in these cases can actually be counterproductive, creating disturbed habitats where wild barleys may thrive. This entry was posted on Thursday, April 23rd, 2015 at 10:09 pm	and is filed under Uncategorized. You can follow any responses to this entry through the RSS 2.0 feed. Responses are currently closed, but you can trackback from your own site.